While some dogs diagnosed with cancer can be treated successfully and survive for years, a diagnosis of cancer for your dog often means the time you have left together is limited. 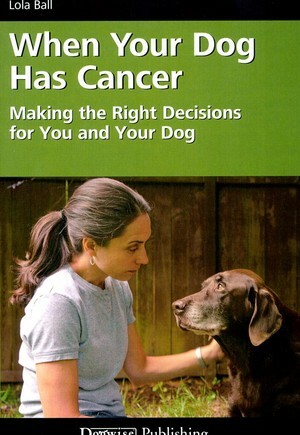 In this important new book, author Lola Ball provides answers to the question of what you the owner can do and what your alternatives are if your dog is struck by cancer. The most important first steps are to arm yourself with knowledge about the different types of cancers, medicines, treatment alternatives and prognoses. But what if treatments do not succeed? What are your options then? This is the point at which most owners are left alone not knowing what to do. Based on her two experiences with cancer in her own dogs, Lola explores the range of choices you do have and strategies you can employ to make the best of the time you have remaining with your dog. You will learn: Many of the concepts and techniques employed in human hospice and palliative care can be applied successfully to dogs with cancer. The power of continuing to interact with your dog-walks, petting, grooming, massage-for as long as the dog is physically able to enjoy it. How "natural death" can be an alternative to euthanasia in some cases.